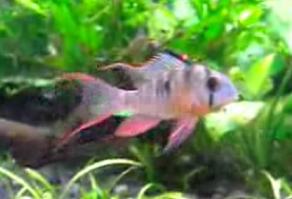 Bolivian Ram Cichlid belongs to the diverse freshwater Cichlidae family. The shape of their body is often mistaken as Blue Ram Cichlid but the fins are spread much wider. Provided that they are given perfect living condition, the fish can grow up to 5 inches in length. Other characteristic of the fish is that, basically it has silver coloration and the male is bigger sized compared to the female. There are conflicting opinions among fish owners about how easy it is to care for Bolivian Ram Cichlid. In order to be successful, you will require large aquarium, which measures at least 30 gallon. As with other tropical freshwater fish, they need soft waters with pH close to neutral while temperature is in the region of 26 to 28 degrees Celsius. The Bolivian Ram Cichlid is generally a peaceful fish and they can be mixed with other community fish like neon tetra, rummy nose tetra, plecos and dwarf gourami. In order to make them feel comfortable in your home aquarium, it is recommended that you should put some driftwood and artificial cave for them to hide. The fish species will eat just about anything and will accept vegetable and meaty diet. Flakes and pellets are fine for them, as long as it is nutritious with high quality ingredients. In order to supplement their protein requirement, you can add bloodworms, mosquito larvae and tubifex worms. However, just make sure that the source, which you obtain the supply of live foods is clean or else, you risk introducing aquarium fish disease to your Bolivian Ram Cichlids. Generally sticking to your feeding schedule of three times a day should be sufficient and you should avoid overfeeding your pet. Nowadays breeding the fish is a lucrative business for the aquarium fish ornamental trade. Upon maturity, Bolivian Ram Cichlids will pair up and in one single spawn, a breeding pair is capable of producing at least 100 to 200 eggs. The fry generally has high mortality rate because the parents will care for them and feeding live foods will accelerate their growth rate.